Fifth’s Disease is a common childhood illness that affects primarily children between the ages of five and 15. In healthy children it is nothing to be worried about, and is, in fact, incredibly common. 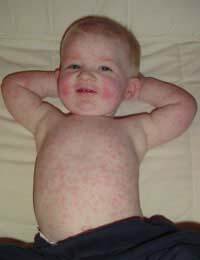 It starts out with a red rash on the cheek, which looks often like the child has been slapped, then spreads to other parts of the body. That’s why it is sometimes known as Slapped cheek syndrome, while it is also commonly referred to as Fifth Disease (both spellings are correct). Fifth's Disease is caused by the parvovirus B19, and is a viral infection that may look scary, but actually clears up quickly and is no real cause for concern for the vast majority of people with normal immune systems. In fact, tests have shown that up to 60 percent of adults worldwide have had the virus at some point in their lives, although most of them had such mild symptoms that they were completely unaware of it at the time. Also known as erythema infectiosum, Fifth’s Disease often breaks out in late winter and early springtime, although it can occur anywhere, at any season. While at first it looks like a bizarre skin complaint, it is actually part of a viral infection that will eventually clear up on its own. Fifth’s Disease is usually most contagious before the rash appears, so many people don’t know they have it until they unwittingly pass it on to others. In fact, most people don’t know they have the virus until four days to two weeks after they have become infected. Like many viral illnesses, the virus that causes Fifth’s Disease is usually passed on through tiny droplets in coughs and sneezes. So teaching your children to cover their mouth when they sneeze and/or cough, to use a tissue and to dispose of it properly is key to stopping the spread of this illness. At first the red facial rash appears, which then spreads to other parts of the body. It can be accompanied by a fever and similar flu-like symptoms, such as a runny nose, sore threat and overall feeling of malaise. Some children will also experience nausea, diarrhoea and occasionally abdominal pain, while adults with Slapped cheek syndrome can get aching joints. In very rare cases, neurological or cardiovascular symptoms have been reported amongst members of the adult population who come down with this illness. If your child has a weakened or impaired immune system due to the HIV virus, leukaemia or other medical conditions (such as a blood disorder like sickle cell anaemia), then Fifth’s Disease can be a cause for concern. The viral infection can slow own the production of red blood cells, and cause anaemia. It can also cause severe anaemia in foetuses that may result in miscarriage, although the majority of pregnant women are immune. If you are pregnant and have been around someone with Fifth’s Disease and notice a rash, see your GP immediately. Similarly, if you or your child has the parvovirus and you are in contact with someone who is pregnant, inform them – and inform your child’s school. If you suspect your child has Fifth’s Disease, or indeed if you have it, see your GP for a proper diagnosis. Usually diagnosis is straightforward, but in some cases a test maybe taken to look for antibodies to the parvovirus. Fifth’s Disease, in the vast majority of cases, is a common childhood infection that passes without incident. Bedrest and paracetamol are usually all that’s required for a complete recovery. Good luck!